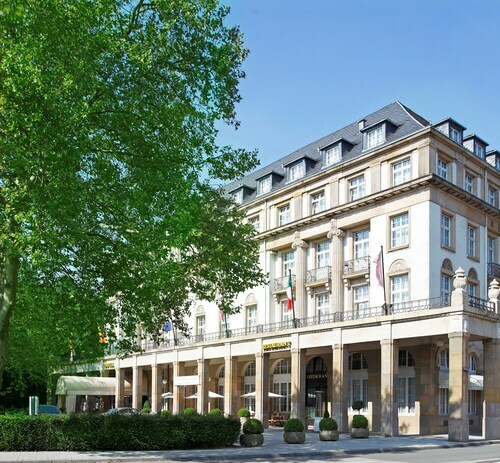 Situated in Karlsruhe, this hotel is within 9 mi (15 km) of Botanical Garden, Messe Karlsruhe, and Karlsruhe Zoo. Ettlingen Palace and Karlsruhe Palace are also within 9 mi (15 km). 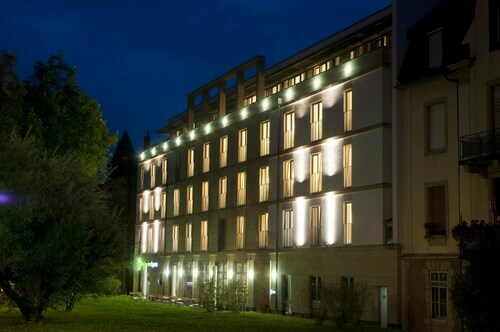 Situated in Karlsruhe, this hotel is within 1 mi (2 km) of Karlsruhe Zoo and Messe Karlsruhe. Europahalle and Federal Court of Justice are also within 1 mi (2 km). Karlsruhe Bahnhofsvorplatz Station is 7 minutes by foot and Karlsruhe Central Station is 7 minutes. Located in Karlsruhe City Centre, this hotel is within a 10-minute walk of Federal Court of Justice and Messe Karlsruhe. Prince Max Palace and Marketplace Square are also within 15 minutes. Karlsruhe Bahnhofsvorplatz Station is 17 minutes by foot and Karlsruhe Central Station is 17 minutes. Situated in a regional park, this luxury hotel is within 1 mi (2 km) of Lichtentaler Allee Park, Casino Baden-Baden, and Friedrichsbad. Caracalla Spa is 0.9 mi (1.5 km) away. How Much is a Hotel Room in Stupferich? Hotels in Stupferich start at $58 per night. Prices and availability subject to change. Additional terms may apply. Within a 6-mile (10-kilometer) distance of the hustle and bustle of Stupferich, with Travelocity's reservations page you can unearth a limited, yet excellent range of places to rest your head. Travelocity's comprehensive database currently is showing 3 hotels, apartments and other accommodations options within easy driving distance of the center of Stupferich. 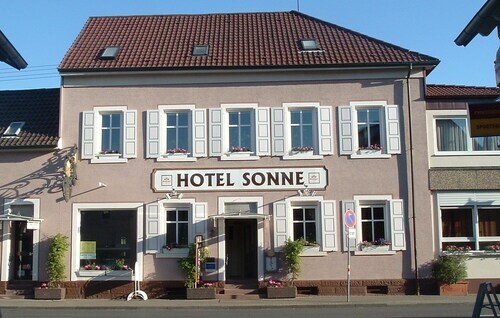 The Hotel Sonne, is an exciting accommodation option for travelers as it's the most centrally situated Travelocity-listed hotel option in Stupferich. 18 miles (29 kilometers) outside of the town center of Stupferich, you can find the Der Kleine Prinz. 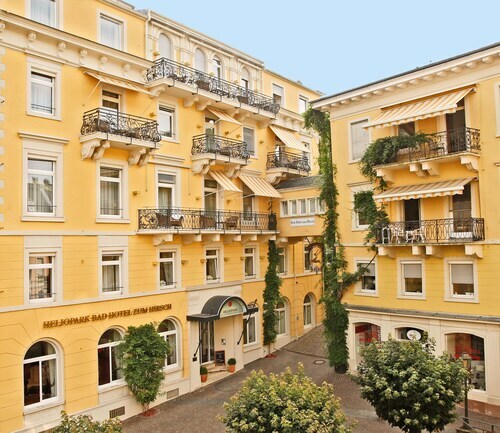 Alternatively, the Hotel Belle Epoque Baden Baden is about 18 miles (29 kilometers) away. Other possible Travelocity-registered hotels include the Aqua Aurelia Suitenhotel and the Hotel Restaurant Erbprinz. The greater Baden-Wuerttemberg region is worth having a look at as well. Baden-Wuerttemberg offers rivers, and other popular visitor sites include castles, old towns and historic mansions. In this part of Germany visitors might take up the chance to partake in snowboarding, skiing and cross-country skiing. Baden-Baden is 19 miles (30 kilometers) southwest of Stupferich and features Friedrichsbad and Caracalla Spa. 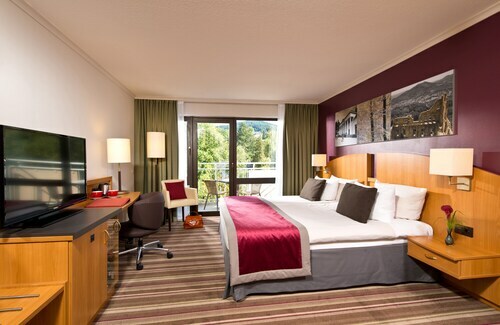 A few Baden-Baden accommodations include the Dorint Maison Messmer Baden-Baden and Atlantic Parkhotel. 6 miles (10 kilometers) northwest of Stupferich, is Karlsruhe, home to the Schlosshotel Karlsruhe and Rio Hotel. The Botanical Garden and Karlsruhe Palace are a couple of the most popular sites to explore should you visit Karlsruhe. Ensure a fix of local sport by making the trek to Mercedes-Benz Arena, which is located 35 miles (56 kilometers) to the east of Stupferich. Travelocity customers who enjoy the idea of finding a hotel close to the game, book in the Le Méridien Stuttgart or Waldhotel Stuttgart. Now that you've become enlightened about the Travelocity-listed hotels and apartments in Stupferich, be sure to get to know Travelocity's Stupferich travel page for information on the many ways to enjoy yourself in this corner of the world. It was fun watching the World Cup at a local outdoor restaurant that one of the staff members recommended. Having a grocery store close by was a big help on snacks & drinks. Hotel is clean and close to central train station flixbus and tram stations. I would not recommend it still because the housekeeping staff does not bother to knock and simply walk in. I was in the bathroom when I heard people talking and came out in about 5 to 10second to check. The staff was not wearing hotel logo or shirts etc and I could not recognize them for few odd seconds. Also the bed was single bed definitely not as pic while booking. Decent hotel for budget travelers, situated just off a busy road junction. Spacious, clean room with large and really comfy beds, nice balcony and very clean bathroom. Restaurants, McDonald, Subway, KFC are nearby. A great stay and we would recommend this hotel. Lovely surroundings, perfect location, excellent and helpful staff. Room was pretty, but not over the top. Beds and linens wonderful. Decent spa. My partner loved the breakfast! Would definitely return again and again. I had been told in advance that this was a budget hotel by a friend. Although, the room and bathroom were small, it was far from a budget hotel. I was greeted at the front desk with friendliness and good service. We ate breakfast there one morning and it was excellent. The location was excellent. As planned, we wanted to be right down town. I will be visiting Karlsruhe again and will definitely stay there. Great value!